Professor X is gathering his team of mutants! In Munchkin: X-Men Edition, it's your job to beat the villains of the X-Men universe, get the best loot, and win! The newest game from our friends at USAopoly features some of your favorite heroes teaming up to take down the likes of Magneto, Sabretooth, and Juggernaut. Play a student of the School for Gifted Youngsters, each with his own special power, and join forces with other powerful X-Men, like Cyclops and Wolverine, collect loot like Magneto's Helmet, and align yourself with factions like the X-Force to help you win. Plus, like a true mutant, Munchkin: X-Men Edition mixes well with other Munchkin games! (Find more about combining Munchkin sets in this previous Daily Illuminator article.) Try out some combos for yourself and tell us how it goes on Facebook and Twitter! 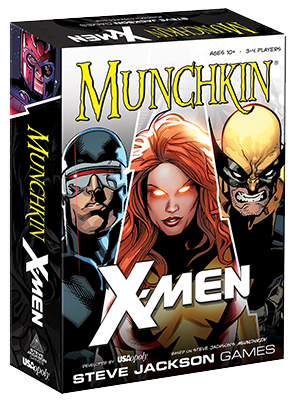 You can find Munchkin: X-Men Edition at your local game store now!